Stomach pain, bloating, "ga (PantherMedia / Robert Kneschke) s" and diarrhea are all typical symptoms that many people have after eating or drinking dairy products. People who have difficulty digesting dairy products may only tolerate small amounts of lactose (a sugar found in milk and other dairy products). This is called lactose intolerance. But some people who are sensitive to milk might actually have a different problem. It is important to get the diagnosis right before deciding to make major changes to your diet, especially in children, teenagers and people who need more calcium. Lactose intolerance is not an allergy. This is an important difference. People who have a true milk allergy can react to even a tiny amount of dairy foods or milk. But people who are lactose intolerant can sometimes consume quite a lot of these products without having any major problems. Babies' digestive systems are designed to survive only on breast milk. In order to digest milk, babies produce the enzyme lactase. It breaks down the kind of sugar found in milk – lactose – in the bowel so that the body can process it further. When a child is weaned off breast milk, their digestive system gradually adapts to other foods. Their body then produces considerably less lactase, and can therefore only break down smaller amounts of lactose. If an adult consumes more lactose than their body can break down with the available lactase, the excess lactose remains in the bowel. It passes on into the large intestine, where it is digested by intestinal bacteria (fermentation). This leads to the increased production of gas and other byproducts, which cause the problems. This naturally occurring form of lactose intolerance is known as primary lactose intolerance. The amount of lactose an adult can tolerate varies from person to person. Your genes play a role here: While relatively few Northern Europeans are lactose intolerant, this problem is common in Asian or African people. 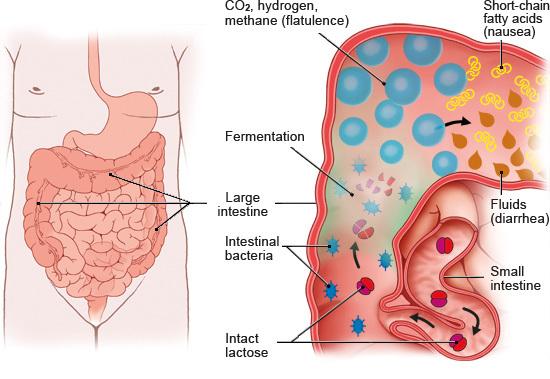 In acquired or secondary lactose intolerance, the small intestine starts producing too little lactase because the lining of the intestine has been damaged. This may be caused by chronic inflammation of, or injury to, the lining of the intestine. Lactose intolerance is very rare in children under the age of five. It typically develops in teenagers or adults. Although lactose intolerance is very common all over the world, there are significant differences between regions and populations. About 5 to 15% of Europeans are lactose intolerant. It is least common in Northern Europe. In contrast, it is estimated that 65 to 90% of adults in Africa and East Asia are affected. To diagnose lactose intolerance, you can do an elimination diet followed by a "lactose stress test." This involves avoiding milk or dairy products for a certain amount of time, and then drinking a lactose solution at a doctor's practice. Your body's reaction to that is then monitored. A lactose tolerance test measures blood sugar levels before and several times after drinking a lactose solution. This makes it possible to find out whether the body is able to break down and absorb the lactose. A breath test can also be done. This measures the hydrogen content of your breath after drinking a lactose solution. The amount of hydrogen in breath is normally higher in people who are lactose intolerant. There is no treatment that can "cure" primary lactose intolerance. But it's possible to live a symptom-free life by changing your diet. In the case of secondary lactose intolerance, it's important to find the exact cause and have it treated. 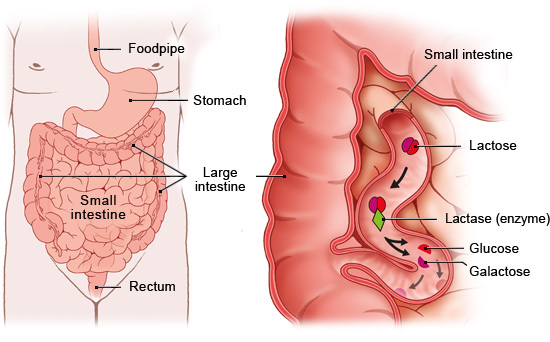 If the lining of the intestine improves through treatment, the symptoms will go away. Dairy products aren't essential for a balanced diet, but you do need to make sure you get enough calcium. Good sources of calcium include green vegetables such as spinach and green cabbage, and calcium-rich mineral water. Aged cheeses such as parmesan or older gouda also contain a lot of calcium. These foods are usually well tolerated by lactose-intolerant people. If you find it too hard to give up dairy completely, you can test how much lactose you tolerate and then spread that amount out across your day in combination with other foods. People with severe lactose intolerance usually don't eat any dairy products at all, although it can be difficult to avoid them if you eat out. Instant meals also often contain lactose. Some people then take dietary supplements to prevent a reaction. Dietary supplements containing the enzyme lactase are available in the form of tablets and capsules. They are meant to help the body break down lactose. But there is no scientific proof that they work. The few studies that were done on these dietary supplements didn't show that they improved or prevented the symptoms. Misselwitz B, Pohl D, Frühauf H, Fried M, Vavricka SR, Fox M. Lactose malabsorption and intolerance: pathogenesis, diagnosis and treatment. United European Gastroenterol J 2013; 1(3): 151-159.